Manufactured by T & Co. With a Birmingham sterling silver assay mark and 1928/9 manufacture code. 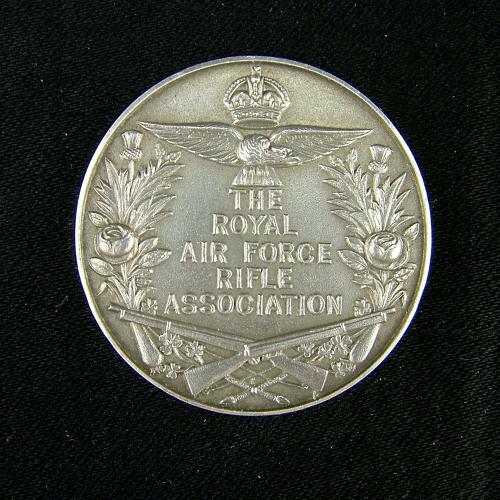 Interwar period silver medallion issued by The Royal Air Force Rifle Association. Approximately 3.8cm diameter. Inscribed to edge ' SQUADRON CUP WINNERS 1929'. The reverse face of the medallion has not been engraved with the winning squadron details and remains blank. Weighs 26 grammes. Approximate scrap value £10. Stock code NIV-MED.